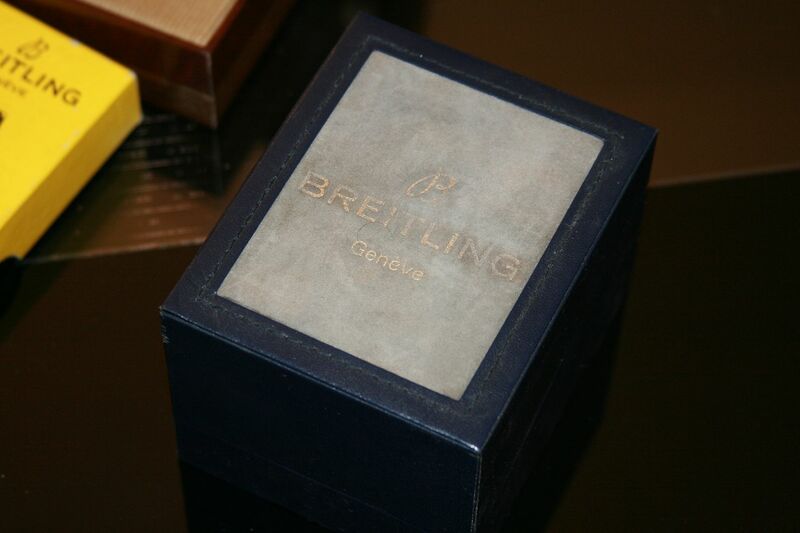 A genuine Breitling box is a pleasant companion for a vintage Breitling watch . Few vintage watches come with a full set . 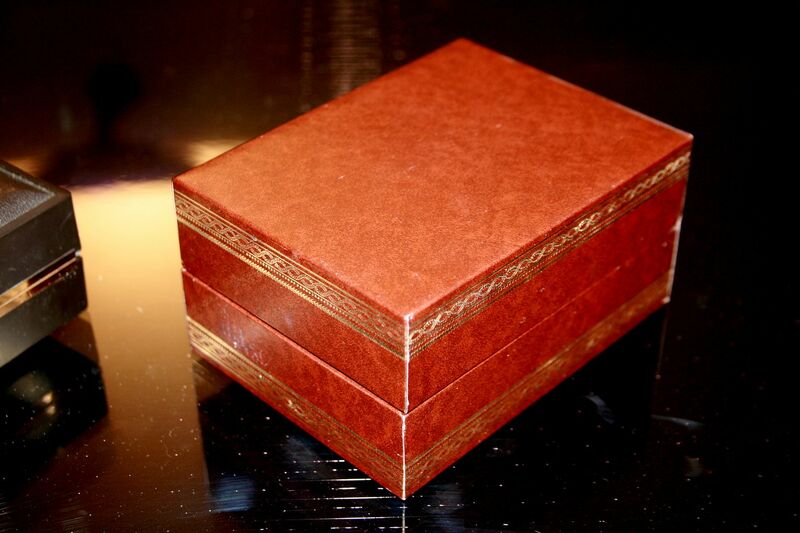 If you are not so lucky that you find the full set , maybe you can find the contemporary box . I bought my 1962 AOPA from a business contact in Portugal ; it had been bought new in Lisboa by his uncle, a flight captain who worked for a spanish airline. 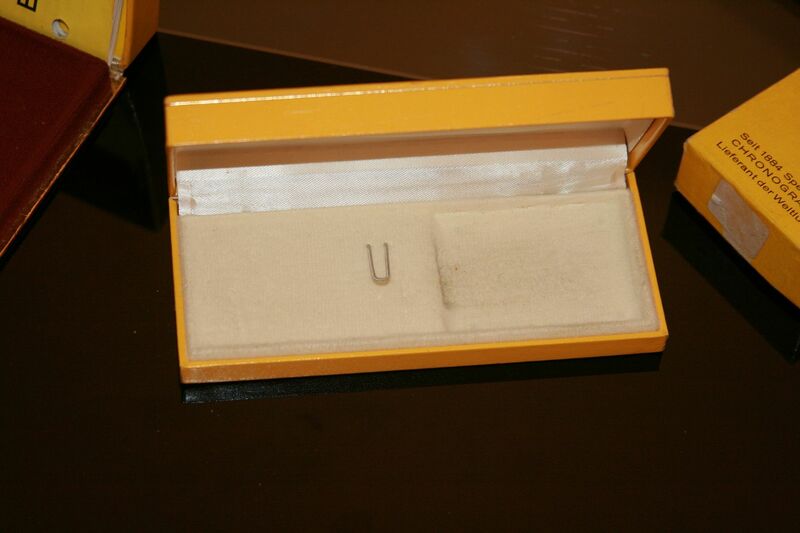 4 years after buying the watch, the box and papers were found and offered to me. 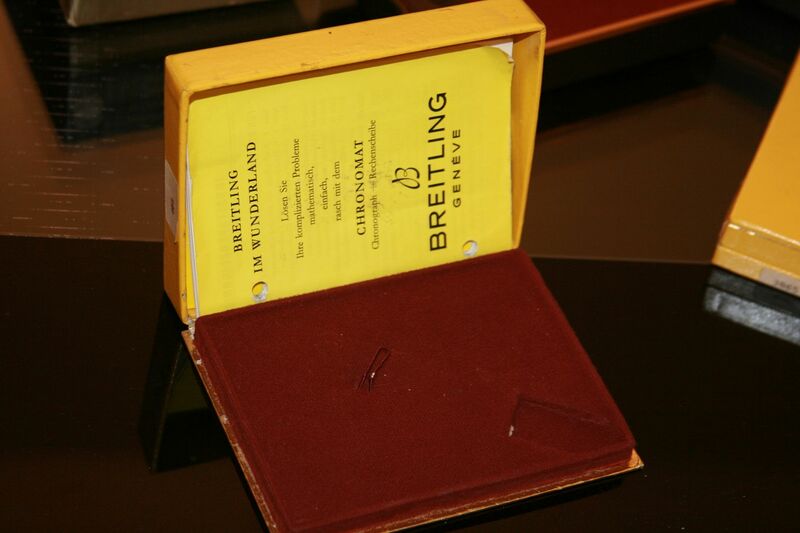 Concerning the Chronomat 769 dated 1943, it is a further box . All others on the "family pic" have their original full set. For the 806-E , I had no box and found 2 different from the 1970-1972 period . One has a yellow top, and the other has a silver top . I don' t know what is the good one . I have been told that one top color was for automatic watches and the other for manual wind watches . Who knows more ? will post some more vintage boxes tomorrow, would be nice to get an overview. That's an impressive collection. I've never really been bothered by boxes, but they do look good together. Here are some more pics of the 71-72 boxes . 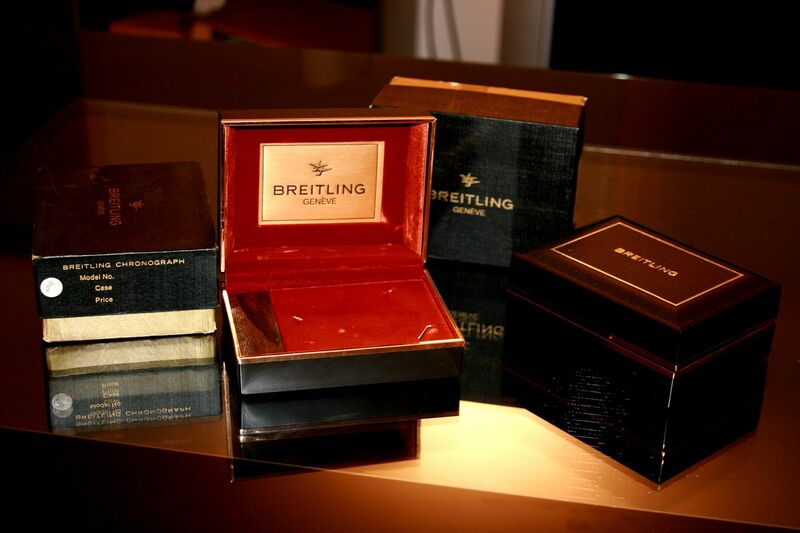 The pics are well known as Breitling used then in many ads , but the boxes themselves are quite hard to source In those ones I lack the watch holders . Here are some pics of 2 early Navitimer boxes. The small one nests my 1962 allblack AOPA ... and the biggest one is circa 1967 . My 1967 ref 2002 came with a smaller box like your 1962. I have the correct papers, though. 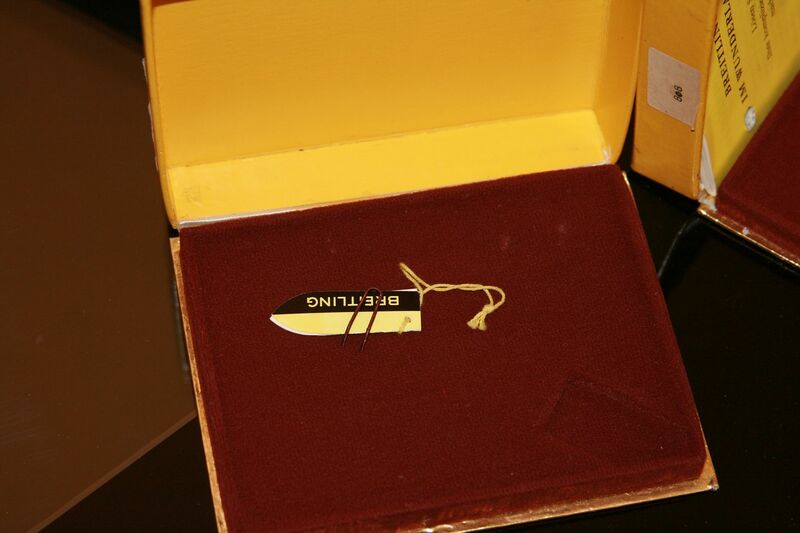 Would this mean the original buyer (in 1970) might have had his box switched at the time of purchase? On a side note, is there an online resource telling what boxes were used what year? like with many other subjects, there seems to be no good online resource about vintage boxes, so let us build one. two boxes I received with "safe queen" 1966 & 1967 Navitimer 806s from the US, both came with papers. this one came with a nice 806 from Germany, 1966. Included papers and the hang tag ! Does that mean different markets had different boxes? 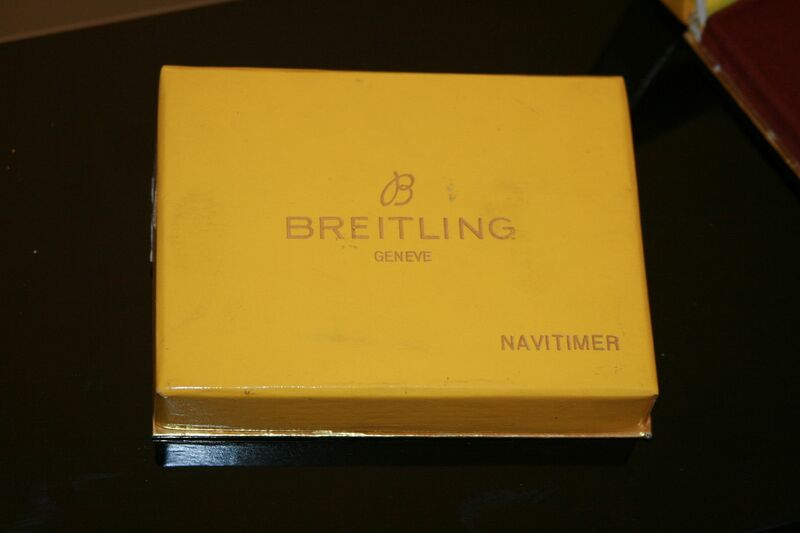 I think yes, the US also had Wakmann/Breitling co-branded boxes, afaik the model branded yellow carton boxes w/ velvet interior were Europe only, saw some grey linen boxes w/o model names w/ silken interior lining too; there were also late yellow carton boxes for the big case line w/ model names, in a DVD-cover form format surprisingly, have none of those. hope other box owners will add theirs. Fred , congratulations for those NICE boxes! 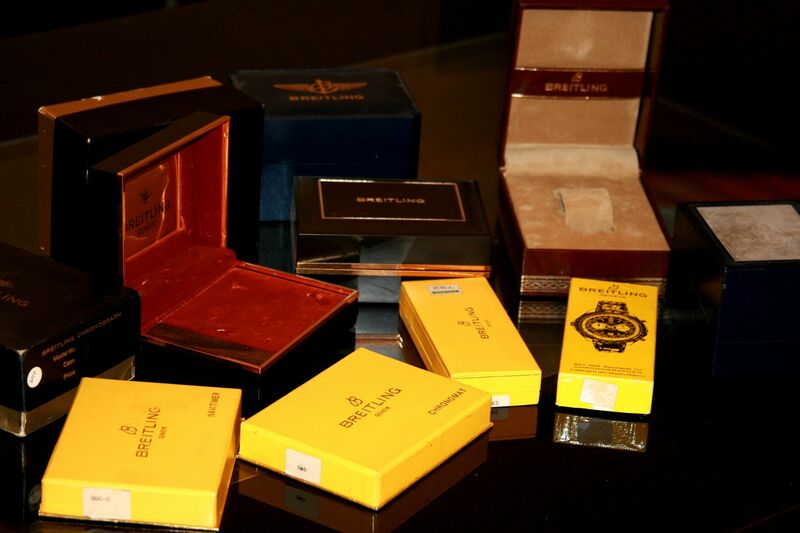 As far as I know, the big brown boxes with orange velvet were seen on US market only . In Europe, appeared first the small box with burgundy interior ( 1956 or 1957?) then the same small box with pale yellow to cream interior (1963 to 1966), and the bigger yellow box with burgundy interior ( 1966 to ? ), either with Navitimer, or Cosmonaute, or Chronomat marking on the cover.Those 3 versions were from the same swiss manufacturer. I had never seen before your corduroy box for SuperOcean. I have another kind, dated circa 1953-54 , as pictured in Richter's book , for TransOcean ( no interior in mine). 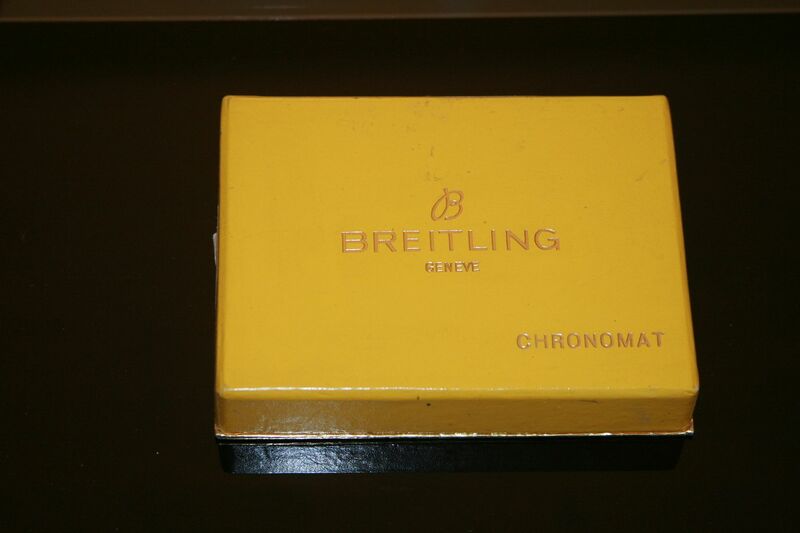 On the same pic you can see illustrated on the right, what would be the box for an early Chronomat. I have never seen a real one. Concerning the blue boxes, my knowledge is that your one with grey lining and cover would be from the beginning of Schneider era , dated 1985-1986 , it would be the right one for your 81600 Cossie . 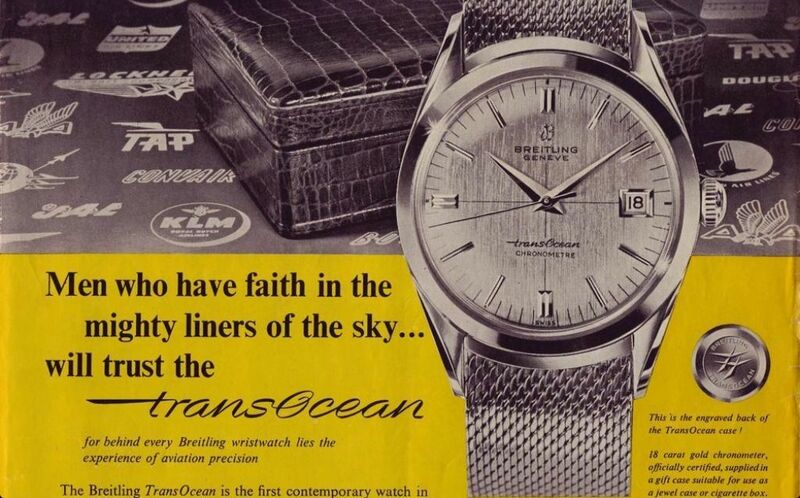 Maybe it was reused from former company, as it is marked Breitling Genève. Remember that first Schneider produced only quartz watches in Grenchen . 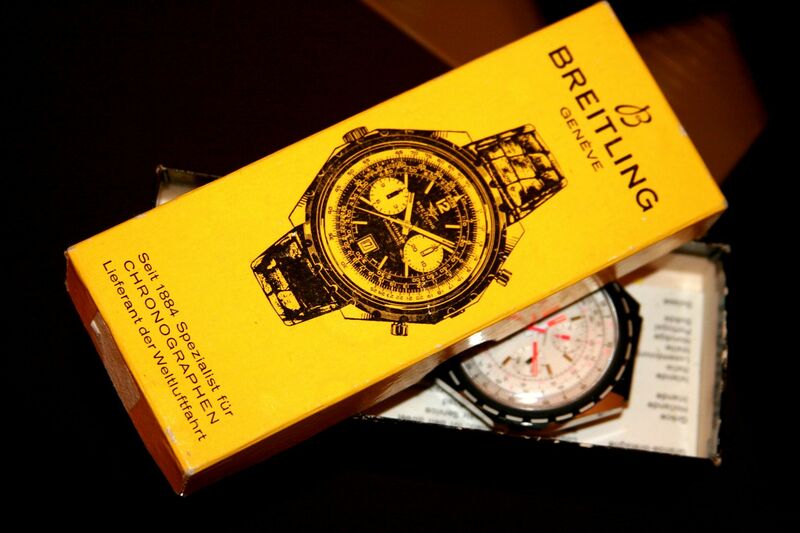 I have an official warranty leaflet dated 1986 May that is marked Breitling Genève ? The blue box in the background - white lining - is for 1990-1991 range . 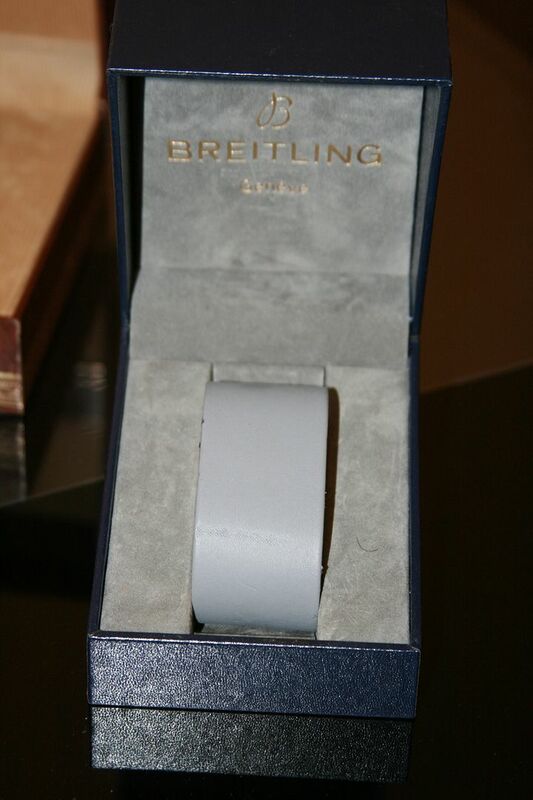 There is an intermediary model, blue leatherette with grey lining , for 1987 to 1989 range . Here's my forever favourite Wakmann AOPA Navitimer box. 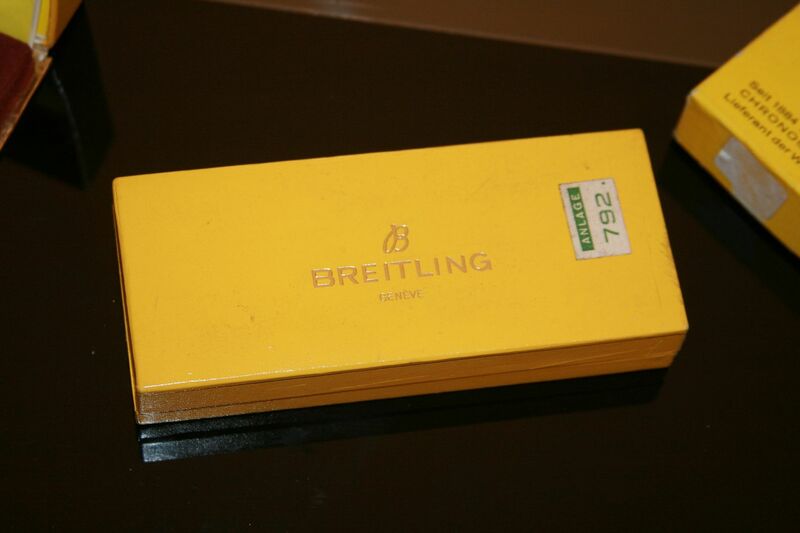 Hi all, who knows this kind of Breitling box , L=150mm x l=65mm x h=28mm? I found it as NOS from a former B dealer in the 70s, unhappily it was empty . 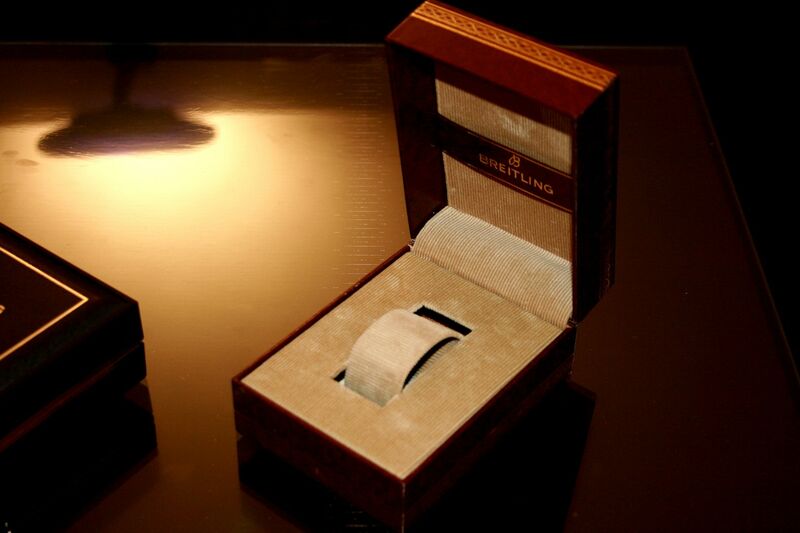 The slot for placing the strap inside is around 22mm.